OBJECTIVE: The potential for internal hernias and subsequent bowel obstruction following laparoscopic RNY gastric bypass (RYGB) mandates closure of mesenteric defects. We have previously recommended the use of non-absorbable suture material to limit this complication. 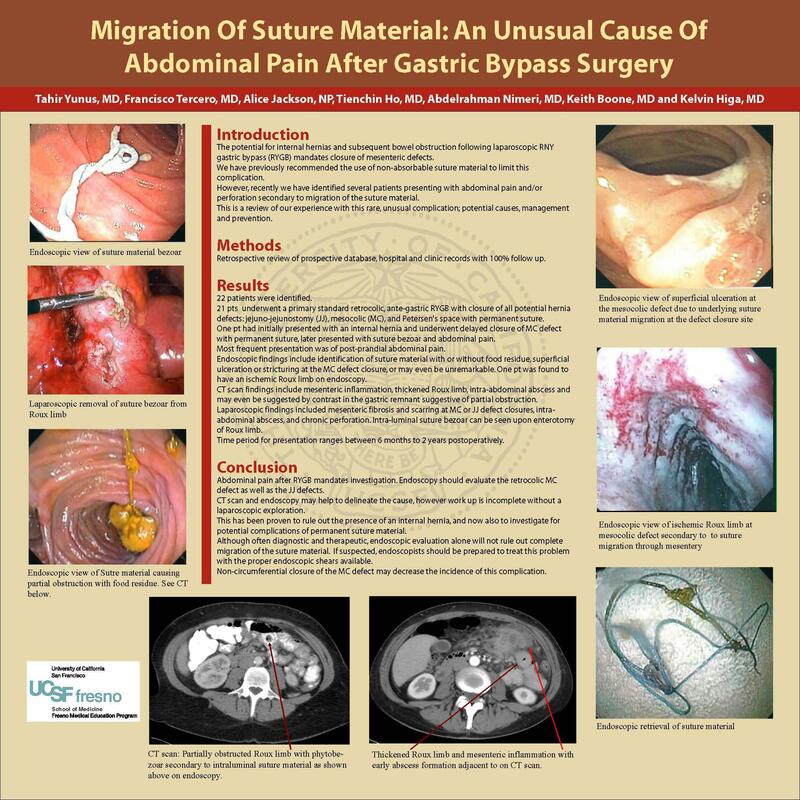 However, recently we have identified several patients presenting with abdominal pain and/or perforation secondary to migration of the suture material. This is a review of our experience with this rare, unusual complication; potential causes, management and prevention. METHODS: Retrospective review of prospective database, hospital and clinic records with 100% follow up. RESULTS: 12 patients were identified: (1) male, (11) female; mean age at presentation 43 yrs. All had undergone a primary standard retrocolic, ante-gastric RYGB with closure of all potential hernia defects: jejuno-jejunostomy (JJ), mesocolic (MC), and Petersen’s space with permanent suture. Most frequent presentation was of post-prandial abdominal pain. Mean interval between RYGB and presentation was 16 months. 11 pts underwent 13 endoscopies, 10 were diagnostic, and 3 were negative. 8 endoscopies identified intra-luminal suture bezoar, 3 were therapeutic using endoscopic shears and 3 were suggestive due to stricturing in roux limb at MC defect. 11 CT scans were obtained in 8 pts, 6 were normal, 5 had positive findings including: mesenteric inflammation n=4, intra-abdominal abscess n=1 and contrast in the gastric remnant suggestive of partial obstruction n=2. Nine pts were managed by exploratory laparoscopy, 1 pt was explored twice. Laparoscopic findings included: mesenteric fibrosis and scarring at MC or JJ defect closures n=6, intra-abdominal abscess, chronic perforation n=2 and free air after endoscopy n=1. Intra-luminal suture bezoar was seen in 10 pts, 1 pt had extra-luminal suture abscess, and 1 pt had chronic MC defect fibrosis. CONCLUSION: Abdominal pain after RYGB mandates investigation. CT scan and endoscopy may help to delineate the cause; however work up is incomplete without a laparoscopic exploration. This has been proven to rule out the presence of an internal hernia; and now also to investigate for potential complications of permanent suture material. Although often diagnostic and therapeutic, endoscopic evaluation alone will not rule out complete migration of the suture material. If suspected, endoscopists should be prepared to treat this problem with the proper endoscopic shears available. Non-circumferential closure of the mesocolic defect may decrease the incidence of this complication.